The hogs of Ossabaw Island, off the coast of Georgia, are descendants of Spanish pigs brought to the New World over 400 years ago. They were small range pigs with prick ears, heavy coats and long snouts. Over time, some of the Spanish pigs escaped and became feral in southeastern forests. While most feral pigs eventually mixed with domestic pigs, the Ossabaw Island animals are an exception, having remained a distinct and isolated population. Thus they reflect their Spanish heritage more closely. As the pigs adapted to Ossabaw Island, they became yet smaller, a process called "insular dwarfism." They also had to adapt to the food cycle on the island, which provides little to eat during the spring season. As an adjustment, the Ossabaw Island hogs developed a unique biochemical system of fat metabolism, enabling them to store a larger proportion of fat than any other hog. In conjunction with this, they have a form of low-grade, non-insulin depend diabetes, making them excellent medical research animals. They have been studied for over a decade at the University of Georgia and other institutions. The unique qualities of the Ossabaw Island hogs do not limit their uses for traditional production. 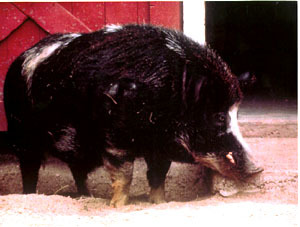 Although in the wild they are smaller than other pigs, with pregnant sows weighting less than 100 pounds, Ossabaws grow much larger in captivity. Colors include black, spotted black and white, red and tan. It is currently not possible to import animals directly from Ossabaw Island due to quarantine restrictions. Small breeding groups of Ossabaw Island hogs, descendants of animals brought from the island during the 1970's, can be found on the mainland. Offspring of these animals are available from time to time from individual breeders. The Ossabaw Island hog population is classified as Critical by the American Livestock Breeds Conservancy. The ALBC estimates there are fewer than 200 available in mainland breeding programs, although many more animals can still be found on the island itself. Anyone interested in more information about this breed should contact the American Livestock Breeds Conservancy.